Note: belongs to the normal phenomenon. awesome product, super quality, packed real good. very happy with it, can’t wait to use it. Very good quality and beautiful made. I strongly recommended this. Thank you so much. it is a very very good leash! i am fully satisfied. the belt is adjustable and fit to my waist (72 cm) and also for bigger waist (105 cm and more). 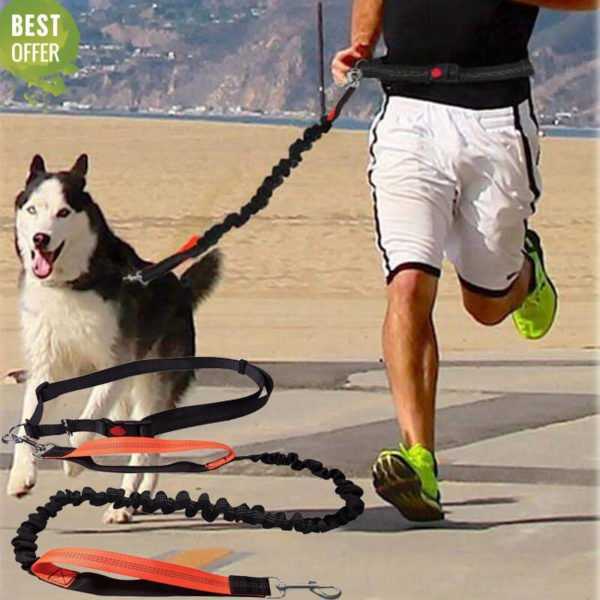 the leash is very elastic (61 cm in fix position and 133 cm in relaxed). the buckle can be put in safety position with the red button (then it cannot be opened). there are 2 metal rings on the belt, one of is fixed and one can be moved (and fixed anywhere on the belt). the material is very good and strong. the color is beautiful. sewing is perfect. it was tried for a little run and it is working well! thanks! strong and flexible. perfect for running with a large dog. I was very nicely surprised by good quality of the product!!! Sewing is very good. It is OK even for a big and strong dog as the mine is. Thank you. Fits the description of the product. Is that quality nice with insurance in the closures. The recommended. The product arrived in good condition, superb quality. It is the same as the picture. Looks very quality nice at first glance, estiy happy with my purchase!! Looks strong and as on picture , thanks !! Excellent Quality and get very fast.